The Heart and Stroke Foundation's Health Check program here in Canada sells companies the right to print the Health Check logo on the fronts of packages of products that satisfy anywhere from 3-7 nutritional criteria. Health Check advertising tells Canadians that if they see a food with a Health Check they can feel assured that product is "part of a healthy diet" and that it's been evaluated by the Heart and Stroke Foundation's dietitians. Only companies who pay can play. Hannaford Brothers' Guiding Stars is a front of package food labeling program recently rolled out by Loblaws supermarkets here in Ontario. Foods are evaluated on 13 different nutritional determinants of health and are awarded from 0-3 stars with 0 being the worst (think of it as a grade of 0-25% on a test) and 3 being the best (75%-100%). Unlike with Health Check, every single item in the supermarket is scored with the stars appearing beside the price on each and every item's store display. A few days ago I decided to take a field trip to my local Loblaws and further compare Health Checks to Guiding Stars. Up today? 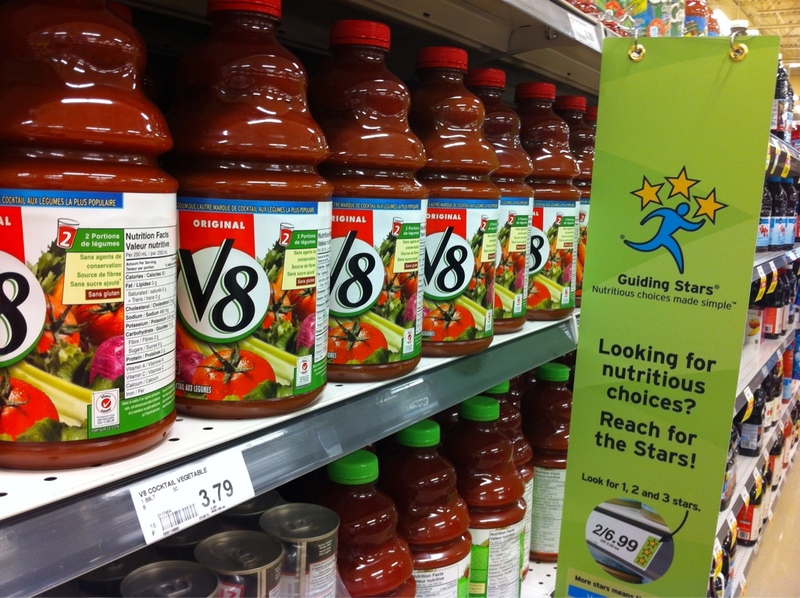 V8 - the drink that pretends it's a vegetable. I guess Guiding Stars doesn't think processed, salty (1/3 of your daily Heart and Stroke Foundation recommended maximum per cup), vegetable juice is so miraculous. And while there are certainly many who need not worry about sodium, somehow I'd imagine the folks who care most about the Heart and Stroke's recommendations (you know, the folks with heart disease, hypertension and vascular disease) are folks for who V8 would be a most unwise regular beverage.